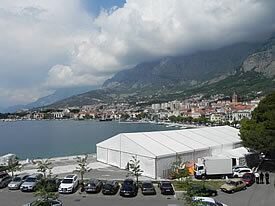 Set against the stunning backdrop of Makarska and the coastal mountains, the Dalmatian Wine Expo is a wonderful opportunity to explore the latest offerings from the local winemakers. In this its second year, the event has moved to a marquee right on the seafront, a big improvement in atmosphere from the sports hall last year! We were there on Friday, and enjoyed the opening festivities including Klapa Srdele, and a rather fine trumpet solo of the national anthem. The entry ticket, unlike similar events I’ve been to in California, doesn’t have a set number of tastes. Basically, you get your glass (which is returned at the end for full deposit back) and you can request wine pours at will. After the experience of last year, we started by heading back out of the tent again to a waterfront pizzeria for lunch and a chance to study the “instructions”. My idea this year was to focus on a specific local grape varietal, one that we couldn’t get elsewhere, and taste the different wine-makers’ versions. So… Pošip it was! 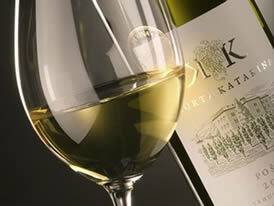 That’s pronounced Posh-ip, a white wine grape originally from the island of Korčula that produces some superb wines. My favourite from last year’s expo was Krajančić’s Pošip Sur Lie, that has since been winning awards in France! 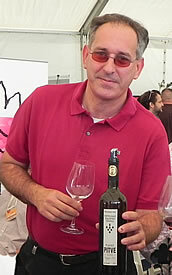 Sadly, it turned out that Luka Krajančić was missing from this year’s expo, so we couldn’t do a direct comparison. I’m sure it’s still up there with the best, though! 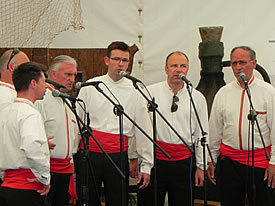 The wineries at the expo with Pošip included: Jako Vino, Korta Katarina, Kunjas, Madirazza, Pošip Čara, De Georgiis, Vinarija Plasa, Grgić and Zlatan Plenković. All very good wines, and many award-winners among them. Our favourite Pošip for this year… the beautifully complex Korta Katarina, with Madirazza a close second. Among the Pošip blends, we really enjoyed Zlatan Plenković‘s Ostatak Bure (Žilavka, Pošip, Chardonnay, Muscat). In between our Pošip researches, we also tried some other local white varietals – Grk, Prč and Bogdanjuša. These are generally lighter wines, and interestingly different. Of these, I really like Bogdanjuša as a perfect summer evening on the terrace kind of drink. The Grk from the Lumbarda area of Korčula is very special. The only place on the islands where vines grow on their own roots and are not grafted onto American rootstock. In the sandy soil, phyloxera can’t survive, and so original vitis vinifera thrives. Is this what wines tasted before phyloxera? Wonderful, rounded, rich whites. Moving on to reds, we looked for wines we either hadn’t tried before, or that would be hard to get without visiting the winery. (Which ought to be done one day for sure!) 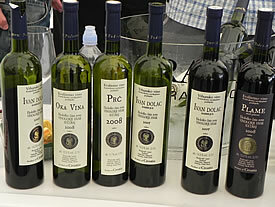 Back at the Hvar wine association stand we started with the certified organic winery Vujnović from Sučuraj. We’d been given a bottle of their Plame a couple of years ago, and enjoyed it immensely, so what else did they have? Well, their top of the range Plavac is the Ivan Dolac Barrique – a wonderful strong-bodied red with lots of spice. With the bar set pretty high, we moved on to try Pitve Plavac – and what a superb wine that is! In general, the best Hvar reds are produced from the southern-facing slopes. But this award-winning wine (gold medal at Vinovito 2010) comes from high up on the northern side of the island around the old hill-town of Pitve. Unfortunately only available in very small quantities, this is right up there amongst the very finest Hvar reds. Missing out some excellent offerings from Zlatan Otok, Bastijana (Tomić) and Carić wineries (but only because we already had some of their wines), we went to see what’s new from Plančić. Their Pharos Grand Cru 2006 turned out to be truly phenomenal, and we definitely need to get up to Vrbanj to visit the winery and buy an entire bottle or two to savour it properly! And finally, we should mention Bibich’s rather excellent Ambra, a traditionally produced prošek that has been collecting awards this year. I always think of prošek in the same way as Italian vin santo – great for sipping after dinner with biscotti! 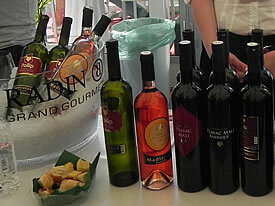 The Dalmatian Wine Expo runs for 3 days, and includes seminars, talks, food and wine pairings. This year it also included special menus by well-known Croatian chefs, in local restaurants. See you there next year!